« Haiti – Wimps to the rescue! After our piece entitled, Singapore – hotbed of terrorists & arms traffickers, the Singapore Straits Times decided it had to make a move. The Straits Times, Singapore’s Pravda, decided it had to show that it, too, reported on Singapore’s criminal elements. For this, the Straits Times dusted off a list of Singapore’s Most Wanted – a list of fairly harmless people involved in fraud. The article is entitled, More Singaporeans on Interpol list. The Straits Times carefully avoided mentioning terrorists, arms traffickers, and those involved with the drug trade in Singapore. After all, Singapore is squeaky clean, isn’t it? Eighteen – is that all? Singapore’s Most Wanted included the following desperados. 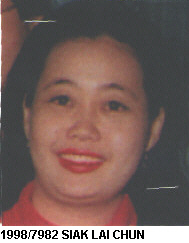 Ms. Siak Lai Chun, whose trail is not very fresh – fled Singapore in 1997 – 12 years ago. She “allegedly” (the word The Straits Times used) stole $18.7 million from the bank where she worked. She would now be 47 years old. Hey, another 20 years on the run, and she will be 67. She is five feet three, supposedly unarmed and not dangerous. Good detective work, Singapore – you’ve only been after her for 12 years. “Fugitive lawyer David Rasif is featured on it,” States the Straits Times. David Rasif was last seen in Thailand in 2006 before he disappeared from Singapore with his clients’ money worth millions. Now, let’s compare Singapore’s list to the Specially Designated Nationals List (SDN) of the U.S. The US Office of Foreign Assets Control (“OFAC”) of the US Department of the Treasury administers and enforces economic and trade sanctions against targeted foreign countries and regimes, terrorists, international narcotics traffickers, those engaged in activities related to the proliferation of weapons of mass destruction, and other threats to the national security of the US. Let’s look who is on the SDN list from Singapore. Steven Law (a.k.a. CHUNG, Lo Ping; a.k.a. HALIM, Abdul; a.k.a. LO, Ping Han; a.k.a. LO, Ping Hau; a.k.a. LO, Ping Zhong; a.k.a. LO, Steven; a.k.a. NAING, Htun Myint; a.k.a. NAING, Tun Myint; a.k.a. NAING, U Myint), 3 Shenton Way, #10-01 Shenton House, Singapore, citizen of Burma. Lo Hsing Han’s Asia World (managed by Stephen Law) and the Burmese junta are also partners in Singapore’s luxury Traders Hotel. 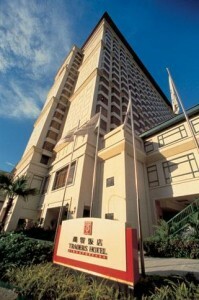 The hotel’s November 1996 opening ceremony was attended by the wanted guy, Lo Hsing Han himself. Steven Law’s Singaporean wife, Cecilia, is also on the SNA list and is the owner of many companies in Singapore. Unfortunately, we were unable to find any verifiable photographs of either Stephen Law, nor of his wife, Cecelia – not even any wedding photos. Kheng Siang Chew (a.k.a. CHOU, Hsien Cheng), Singapore citizen. Aik Haw, at The Anchorage, Alexandra Road, Apt. 370G, Cowry Building, Singapore, is a Burmese citizen. TEZA (a.k.a. TAYZA; a.k.a. ZA, Tay; a.k.a. ZA, Te; a.k.a. ZA, U Tay; a.k.a. ZA, U Te), 6 Cairnhill Circle, Number 18-07, Cairnhill Crest Singapore, is a citizen of Burma. U Kyaw Thein, 503 Sembawang Road, #02-29, Singapore is a citizen of Burma and a permanent resident of Singapore. For those of you who wish the visit the SNA website, and take a look for themselves – click here. Meanwhile, Friday is Singapore’s day for hanging the drug couriers – but only the little guys, the “mules” who carry small loads for the big guys. thanks once again Mr. Harding. Singaporeans can only get wise from media and blogs outside Singapore. No country in history can really build a nation by feeding its citizens half truths. Oi! I thought Malaysia was the hot bed of terrorism, drug traficking and gun running. How else did they lose two F-5 engines to the iranians.Hambali has malaysian wife and a PR. Guys who bombed Indonesia were malaysians. When they died, the govenrment Home Minister was sorry that he had died and sent a govenrment plane to retrieve his body.I don;t have to tell you how the indonesians felt. Putra: So Malaysia joins the club with Singapore – in a small way. Malaysia needs to loosen up its currency and banking controls to be able to lure in the big guys and to become a gangster state like Singapore. Allow me to make a correction regarding the owner(s) of Traders Hotel. I believe you have mistaken the hotel and probably got it mixed up with some other hotel in Singapore which may have inadvertently, through one reason or another, led you to associate the name with Traders. According to my knowledge, Traders Hotel is owned by the Kuok-Allgreen Properties Group, together with the other other properties in the Tanglin area cluster (including Tanglin Mall and Tudor Court). No mistake in what we reported regarding the Traders Hotel in Singapore. We did leave out that Robert Kuok was also an investor. Kuok Singapore Ltd., Lo Hsing Han’s Asia World, and the Burmese junta are all partners in the luxury Traders Hotel chain. There are a number of hotels in this chain – including the Traders Hotel in Singapore. Why did I leave out Kuok? Not enough information to expose him – yet. The huge joint venture of the Shangri-La Hotel group is a deal between Lo Hsing (Stephen Law’s father) and chairman of the Asia World and Robert Kuok. Thanks for the quick reply and explanation, especially your qualification on the status of Robert Kuok. From my knowledge, Traders Hotel Singapore is owned by Kuok Group (here I have to correct myself – through another subsidiary, Cuscaden Properties and not Allgreen as I had posted earlier) in partnership with the Shangri-La Group (of which Kuok also has substantial interests) and another business group. The Traders Hotel in Yangon was previously associated with Asia World but has since been bought over by this tri-partite partnership, and Stephen Law and his ghostly apparition do not seem to have any manifestation here.Maybe only ostensibly so as you have suggested. In any case, there certainly exists a lot of room for further in depth scrutiny of Stephen Law’s association with Traders Hotel (now part of the Shangri-La Group). Whether R. Kuok has any other association with Stephen Law/Asia World other than the takeover of Traders Yangon remains to be seen (unless otherwise proven, I am inclined to respect the business integrity of R. Kuok). Besides the laundering of drug money via Singapore as highlighted in your articles, you may like to know that Singapore is also getting a lot of supply of sand from Myanmar, which is the other reason why the PAP government has been rather quiet in their criticism of human right violations of the military regime in Myanmar. On record Mr Harding is right. The following is a report in 1997 in the The Nation (US) October 20, 1997.
report features two pictures of Asia World factories on its cover. Thank you for sharing some insights on the issue. I agree with the passage of your import. However, I would like to reiterate that Traders Yangon was previously part owned by Asia World and since (1999?) was entirely taken (bought) over by the Shangri-La Group as I had duly informed. Also, as was posted by me earlier, Traders Singapore has got no relation to the shareholding structure of Traders Yangon, but since the last decade both these hotels are now under the Kuok -Shangri-La Group. Traders Singapore was a Kuok Group owned hotel from day one I believe, and the third party involved (besides Cuscaden Properties and Shangri-La Group was an American company I think (the name has presently eluded me). Kuok’s involvement in setting up a hotel base in Myanmar through the takeover of Traders Yangon was purely commercial as I understand (from business circles), because they are presently also reaching out to Vietnam with several projects in the pipeline. As to Lo Hsing Han, his official status here is listed as “fugitive of the law”. We can quibble over this forever, but there are even newer references in the Internet to Lo Hsing and Traders.